Kimi came down from the mountain to spend the weekend in Seattle. She and Dad had big plans to go see the Flying Heritage Collection. This Saturday was the first annual SkyFair. Dad came down from upstairs and met Kimi with a very concerned look on his face. “I was afraid of this”, he intoned seriously. “Afraid of what”, asked Kimi. Dad swept his forearm to his forehead in mock travesty. Dad and Mongo started off on their morning walk as they do just about every day. As soon as their feet left the sidewalk, Mongo hunched up to do his duty. Dad bent over with his poop-bag to scoop it up. It didn’t quite look right. The poop was very light in color. And when Dad scooped it up, it was unusually firm, and somewhat incompressible. Dad tossed it in the trash can. Dad and Mongo walked on a little further. The sun finally crested the horizon , an the park was suddenly filled with the dewy light of early morning. Mongo hunched up again. Now Dad could see the product clearly. Clearly Mongo is a proponent of continuous improvement. 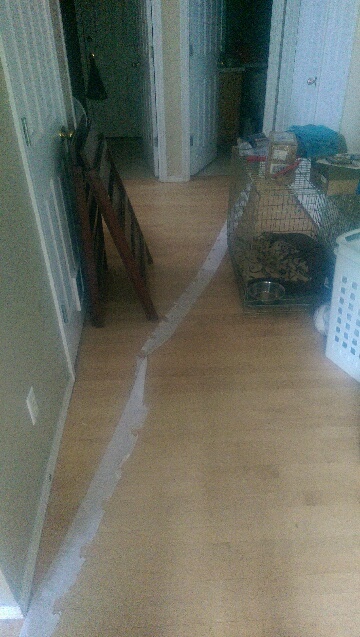 Drewbie woke up the morning and found a strange trail of paper running down the hallway in the house. He traced it’s source back to downstairs bathroom, and its other end to Mongo. To celebrated Drewbie’s return fro his long road trip, Mongo decided to TP the house in Drewbie’s honor. It is tough to beat that honor. Mongo and Dad were walking in the park. . The sun had yet to peek over the horizon. The air was cool, moist, and still. The birds were still frantically engaged in a pre-dawn chirp fest. “C’mon buddy, lets go home. You wanna eat?” asked Dad? At the mention of the word “eat”, all of Mongo’s attentions shifted to Dad. Mongo’s attention immediately shifted to the whistle. His head swiveled 90 degrees on his neck. “Hey Buddy”, Dad said to get Mr. M’s attention back. Mongo swung his massive head back to look at Dad and took a couple of steps towards the house. “Fweep!” Mongo froze in place and swung his head towards the woods again. Mongo swing into a lope next to Dad. Mongo loves the word “eat”. 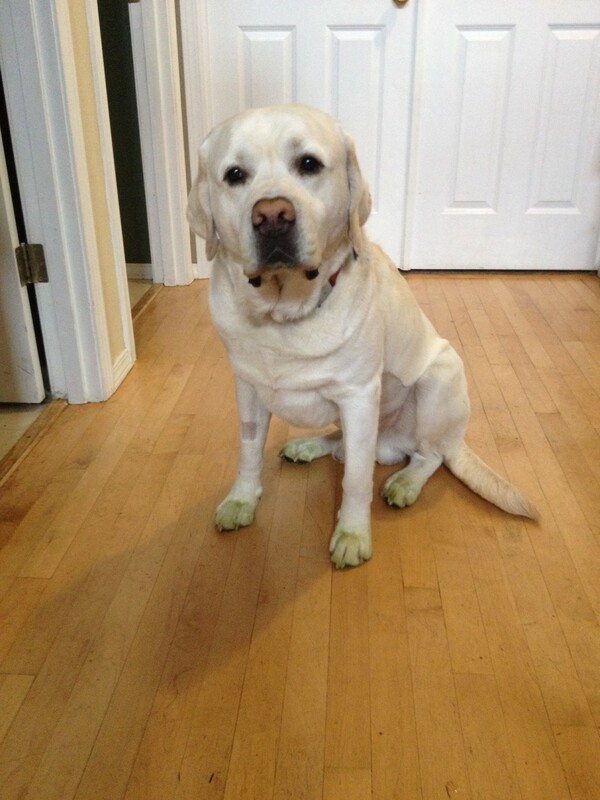 Just because Kimi gives Mongo a bath, does not mean Mongo has to stay clean. Mongo finally had his stitches out, and the drama from eating the rock was behind him. Now, Kimi was determined to clean him up. He had gotten pretty grimy what with his time in the vet, and not being able to be washed because of his stitches. Mongo waked with Kimi to the shower like a condemned doggie to the gallows. He dragged his feet, and his head hung down to his knees as he entered the bathroom. But Kimi was not to be denied. In this case, the distinction between being filthy, or being artfully powdered with dirt, is clearly in the eyes of the beholder. Mongo went back to his regular vet this morning to get his stitches out. The only had him in the back of the practise for a few moments, and then before you could say. “Bob’s your uncle”, he was back in Kimi’s van and ready for more adventures.